Possibly the most vicious hit of all time, or at least the most vicious received by an Auburn player, was laid on Stacy Danley in the 1990 Hall of Fame Bowl against Ohio State. Danley took the lickin’, kept on tickin’, and helped lead the Tigers to ultimate victory over the Buckeyes. For the Auburn Tigers, the 1980s did not end on December 31, 1989. They didn’t even end a few weeks earlier, on December 2, when Auburn faced Alabama in Jordan-Hare Stadium for the “First Time Ever” and defeated them. No, for Auburn football, the decade of the Eighties actually ended on a slick field in Tampa, Florida on January 1, 1990. For on that day, the same squad of Tigers that had beaten the second-ranked Crimson Tide at home—and many of the same players that had given Auburn faithful three straight SEC Championships—faced the Buckeyes of Ohio State in the Hall of Fame Bowl. Wait. The what? The Hall of Fame Bowl? It does seem like an odd choice of bowl games in which to find the SEC Co-Champions. However, at that time, the Hall of Fame Bowl was a New Year’s Day game (when that still meant something) and was in the process of trying to boost its reputation. Players called it the “Fame Game,” and there was just a hint of a growing cachet to it—though of course as we know now, that wouldn’t last long. The game itself is not really remembered among Auburn’s greatest contests of the modern era, but a couple of things do sort of stand out about it, making it well worth the time to re-examine. First in the minds of many, when thinking back to this game, is the incredible shot suffered by running back Stacey Danley early in the second quarter—possibly the most famous (or infamous) blow dealt an Auburn player in modern history (and made all the more remarkable for the fact that he walked off the field and then played throughout the second half!). Equally important, we would argue, is that this was the game after the “First Time Ever” game. The same squad that beat Bama got to take the field against a powerful Big Ten team in Ohio State. It was the first game Auburn played in the 1990s—and it was the last game for the great 1980s teams. NBC Sports. “Championship Monday.” There’s Pat Dye in classic Pat Dye form: sport coat and tie and baseball cap. Pat Sullivan stands next to him in his orange sweatshirt, waving frantically between plays. Reggie Slack is under center, one last time. Stacey Danley and James Joseph swap into and out of the backfield, along with occasional appearances by Darrell “Lectron” Williams. Alexander Wright and Greg Taylor and Shane Wasden and Victor Hall catch the passes. Win Lyle kicks the field goals. Ogletree and Riggins and Billingslea and Crawford chase down Buckeye ballcarriers. And look there, back in the secondary—it’s Eric Ramsey. Oh, my. Auburn comes out slinging the ball around, with Reggie Slack throwing deep for Alexander Wright at every opportunity. (He even runs back kickoffs—and does pretty darned well.) After one early completion, though, the Buckeye defense seems to figure out how to take Wright out of the game. With the other Tigers receivers slipping down on the wet grass (apparently a recurring problem in Auburn bowl games) and otherwise bobbling and dropping catchable balls, nobody seems able to hang on to it. The Buckeyes score first and look pretty strong in the process. Trailing 7-0, Auburn finally gets down to the Ohio State two yard line, but the Buckeyes defense looks pretty danged tough up the middle against the run at this stage, and so Pat Dye elects on fourth down to settle for a short Win Lyle field goal. A little while later the Buckeyes score another touchdown, and the Tigers are down 14-3 early in the second. And then comes the big hit on Danley. If you weren’t old enough at the time and no one’s shown it to you or told you about it before, here is—briefly, because it happened just insanely quickly—what happened. Slack took the snap and dropped back. Danley curled around out of the backfield into the right flat. Nothing but green (muddy, slick) grass in front of him at that point. Slack lofts a gentle pass over to him. He looks back at Slack, watching the approaching ball. Meanwhile, a Buckeye defender comes straight at him, full-bore. It was rough. Visceral. Violent. It was insanely violent. And, above all, it was fast. The Ohio State players nearly walked over the prone Danley in their rush to celebrate. Sideline personnel swarmed out, bending over him. The story goes that Pat Dye told him, “If you can run off, run off.” The TV broadcast doesn’t show it—they went to commercial, and when they came back, he was on the bench, not looking terribly well—but supposedly he did just that: he jogged off, or at least walked off under his own power. Considering that for a long moment it appeared as if they’d be searching for his head, this was very impressive. As I said earlier, he would re-enter the game in the second half and perform quite well. Meanwhile, the rest of the Auburn squad seemed to decide that now would be a good time to wake up, get off the team bus, and actually play up to their potential. And that they did. This, at least, is the popular conception. But it is a misconception. The Auburn passing game actually got worse after the Danley hit. A short time later, Slack was intercepted on a deflected pass by—we kid you not—Bo Pelini! The screen graphic identifies him as “Mark Pelini,” but announcer Don Criqui makes it clear that he’s known as “Bo.” (He also points out that Pelini has played with a broken jaw, broken collar bone, etc.) Does this make Reggie Slack the only Auburn quarterback to have a pass intercepted by the head coach of the Nebraska Cornhuskers? Back to the action: Shane Wasden returns a Buckeye punt for a then-Hall of Fame Bowl record 30 yards, but Slack throws another interception—his second of the quarter—on the next play. Ohio State looks to be trying to run out the clock and get to the half, but the Tigers defense holds and forces another punt. Retreating to field the kick, Wasden then breaks his own barely-four-minute-old record with a 34-yard return down the right sideline. Then Slack hits Alexander Wright inside the 20, and on the next play he hooks up with Greg Taylor for the touchdown with only eleven seconds left until halftime. The quick score before the half was great, but the stats at halftime were not. Auburn had rushed for just 61 yards and thrown for only 74, along with Slack’s two interceptions. This from the team that, in its previous outing, had rolled up 30 points on the undefeated Crimson Tide. Clearly, something had to change. The great Will Collier was in attendance that day, and he tells us: “I talked to several players at a rest stop on the way home from that game. I asked them what the hell Pat Dye said at the half [that fired the team up]. All they did [in reply] was wince and say, “Oooooo!” We can just imagine. The second half begins with Ohio State receiving the kickoff. Auburn’s defense is fired up and the Buckeyes can’t move the ball. Their punt is terrible and Auburn takes over on the Buckeyes’ end of the field, just inside the fifty. After run plays from seemingly every member of the backfield (Joseph, Danley, and “Lectron” Williams), Slack rolls out and hits Taylor again for the go-ahead score. Two TD passes from Reggie, two TD catches by Taylor. After some third quarter back-and-forth, Slack is sacked and leaves the game, and we get a rare Frank McIntosh sighting. It’s interesting to note that Big Frank’s passer rating at that point in the season was in the mid-twenties, with three completions in ten attempts. Eeek. At this moment, however, he comes through like a champion—albeit without winging the ball. He simply gives on the quick draw handoff to Danley, who fights his way for sixteen yards on a third-and-fourteen. Mission accomplished, Frank. Have a seat, son. Slack re-enters the game after that single play. He quickly makes his presence known, running for another critical first down conversion and then, toward the eight-and-a-half minute mark in a very long drive, running into the end zone for the score. Auburn is starting to pull away now, 24-14. Ohio State clearly realizes at this point that things are going against them in a big way. The Tigers defense is breathing fire and smothering everything the Buckeyes are trying to do. That last drive by the Tigers not only pushed the lead to ten but also took the game deep into the fourth quarter before it ended. Facing another fourth down, John Cooper calls for the “Bummerooski,” a fake punt play in which the ball is actually snapped to the blocking back, who then hands it to another player to run with, even as the punter pretends to grab for it as it seemingly sails over his head. Auburn sniffs the trick play out instantly and the Tigers crush the ball carrier for little or no gain. A bad situation for the Buckeyes has become much worse: Auburn now has the ball deep in Ohio State territory. The Tigers waste little time in striking again. Danley rips off a run down to the three, and then Slack rolls out and hits Herbert “the Weapon” Casey (oh, yes—Herbert “the Weapon” Casey) for the score. Now it’s 31-14 and the hay is pretty much in the barn. Ohio State threatens one more time, but Quentin Riggins steps in front of a short pass over the middle for the drive-killing interception and, hey—as NBC actually rolls the credits over the game action—it’s Frank McIntosh, one more time! He hands off a few times, the clock is quickly eaten up and the game ends. It was nice of Ohio State to show up, at least for the first half. Another in their long line of bowl losses to SEC teams goes into the record books, ladies and gentlemen. Reggie Slack gets the nod for MVP, and is carried onto the field on the shoulders James Joseph and Stacey Danley. And there you have it. A game that ended more than two decades ago—a game in some ways nearly forgotten today, a game always overshadowed that season by the monolithic, megalithic contest that immediately preceded it—yet a game that contained very visible and memorable shards of both the past and the future of Auburn football at that singular moment in time. 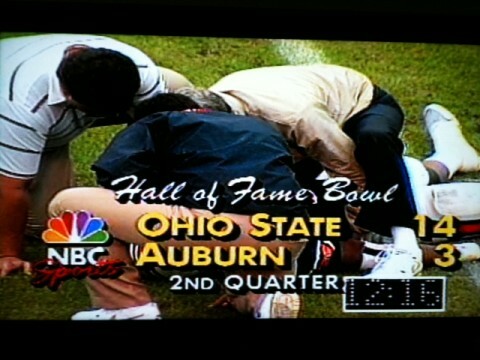 Certainly there were big moments still to come in the Pat Dye Era. The 1990 season would see titanic battles with Tennessee and Florida State, among others. Ultimately, however, that campaign proved to be disappointing, and somewhat foreshadowed the downward spiral of the following two years that would culminate with scandal and investigation and Pat Dye’s resignation in the hours before the 1992 Iron Bowl. If “First Time Ever” on December 2, 1989 was therefore Pat Dye’s Wagnerian operatic climax to his brilliant Auburn career, this Hall of Fame Bowl in south Florida served as a sort of early coda presaging the end of the Dye Era. It gave us one last real look at Dye in his prime, and one last visit with so many of the players that had carried Auburn football to new heights during the decade just ended—before the 1980s themselves evaporated into history like the steam coming off of Tampa Bay. Van Allen Plexico managed to attend Auburn (and score student football tickets) for some portion of every year between 1986 and 1996. He realizes that’s probably not something one should brag about, but hey. He teaches college near St Louis (because ten years as a student was somehow just not enough time to spend at school) and writes and edits for a variety of publishers. Find links to his various projects at www.plexico.net. John Ringer graduated from Auburn in 1991 (which may be the greatest time ever to be an Auburn student – SEC titles in 1987, 88 and 89 and the 1989 Iron Bowl). His family has had season tickets every year since well before he was born and he grew up wandering around Jordan-Hare on game days. He currently lives in Richmond, Virginia where he spends way too much time reading about college football on the internet and teaching his children to love Auburn football. Previous Wishbone columns can be found here. Order Season of Our Dreams — every “Wishbone” column from the 2010 preseason through the fabled Date in the Desert, plus a stadium full of extras. 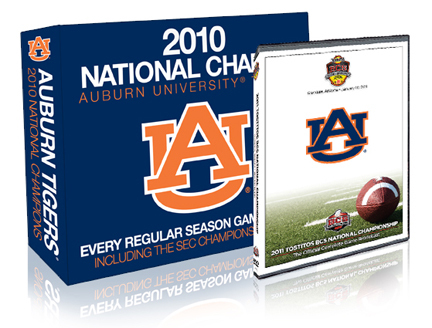 You’ll obviously want to relive Auburn’s national championship season now more than ever. So go to WarEagleDVD.com and enter TWER as your promo code. You’ll get free shipping… and you’ll help your favorite Auburn website keep the lights on during the long winter. I still have this game on tape. I always enjoyed Ahmad Rashad being dismissive of Herbert Casey’s nickname for most of the 2nd half…until Casey caught a TD pass. I usually followed that by watching the 1990 FSU game where Casey was Stan White’s favorite target. The Hall of Fame Bowl is still on New Year’s Day. It has just been corporately sponsored and renamed the Outback Bowl. When we went after the 95 season, they were still awarding the Hall of Fame trophy. That’d be the same “Mrs. Ramsey” who, upon her graduation a few years later, “flipped off” the entire crowd as the walked across the stage to receive her degree. Wonder what they’re up to today? Danley definitely walked/jogged off the field. I was in the stands for this one (and at the barbecue party afterwards). This article is exactly right about it being the most vicious hit on an Auburn player ever. AND aside from the hit on Reggie Cobb from Tennessee in Auburn by Carlos Cheatum in 1990, it was the hardest hit I have seen on or by an Auburn player. I dotted the “i” at this game. I thought the tent party was before the game (New Years Eve)? Ps. Does anyone know if my i-dot and interview on NBC is on this video / DVD?